At that point, the only way to enable debt-serfs to service their debts is too give them free money, i.e. Universal Basic Income (UBI). Scrape away the churn and distraction and the problem is simple: the pie of prosperity is shrinking, and the "fixes" are failing. The status quo arrangement is based on the endless expansion of "growth" and debt, which is the monetary fuel of more, more, more of everything: money, energy, resources, goods, services, jobs, wealth and income, all of which make up the elixir of prosperity. Prosperity is shorthand for a positive return on investment (ROI), a.k.a. primary surplus. Prosperity is the result of there being a surplus which can be distributed after capital, resources and labor are put to work. The higher the return on investment, the more surplus there is to distribute.When the surplus is bountiful, there's enough to go around for everyone to feel that life is getting better. 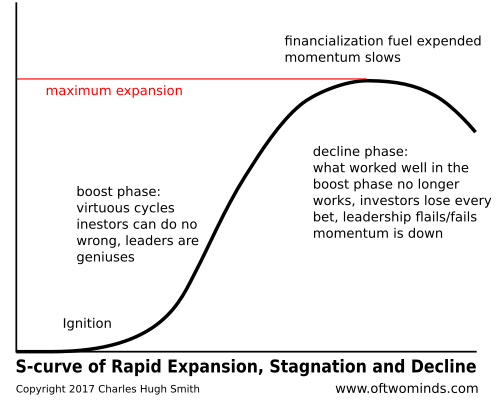 But all systems eventually track an S-Curve of rapid growth, maturation and depletion/decline, and surpluses diminish: the pie stops expanding and starts shrinking. There's less to go around, and suddenly the political squabbling intensifies as every elite and every constituency seeks to preserve their slice of the pie at the expense of others. This means shifting the losses of purchasing power and prosperity onto others without appearing to do so. Openly ripping a slice from the grasping hands of another elite or constituency will launch a protracted political battle, as every group will fight to the death to keep its share untouched. By far the best ways to shift the losses to others are 1) inflation (reducing the purchasing power of their income) and 2) creating phantom wealth that can be used to buy up all the income-producing assets. Unsurprisingly, this is precisely what we see happening globally. Even as inflation eats away at the purchasing power of wages, the governments of the world carefully mask this reality behind bogus statistics of near-zero inflation. While real-world inflation is between 7% and 10% in category after category, official inflation is logged at 2% or less. Wage earners are getting less for their money, and thus their prosperity is diminishing. This reality is further masked by bogus GDP statistics that are deployed as "proof" the pie is still expanding, when in fact only the slices of the few are still expanding at the expense of the many. Meanwhile, the elites benefiting from financialization and leverage are reaping the immense rewards of inflating phantom wealth via credit/asset bubbles.Since the return on investment economy-wide is stagnating, the trick here is to create money out of thin air and use that money to buy up income-producing assets. This inflates asset bubbles which further expand the financial elites' phantom wealth and allows them to keep buying more income streams. The trickery of creating phantom wealth enables the elites to increase their income and wealth well ahead of what's lost to inflation. Creating money out of thin air doesn't actually increase surplus or prosperity, it just shifts the losses to non-elites. Wealth and unearned income are concentrated in the hands of the financial elites, and the bottom 95% of those with earned income are slowly boiled frogs, only dimly aware that the purchasing power of their wages is declining but at a pace just leisurely enough to avoid triggering a political rebellion. Depending on expanding debt to fuel expanding prosperity has this funny feature called interest: since earned income is stagnating or declining when adjusted for real-world inflation for the bottom 95%, interest payments reduce disposable income--every dollar devoted to paying interest on rising debt is a dollar that can't be spent or invested. You see the irony: depending on expanding debt for "growth" eventually chokes future borrowing, spending and investing, causing "growth" to collapse in a broken heap. Without more debt, "growth" is not possible in a world of stagnant earned income and credit-asset bubbles. Central banks have played a game of reducing interest as a means of enabling debt to expand even as the purchasing power of earned income declines, but the game ends at zero. At some point borrowers can't even afford to make payments of principal, and then default becomes inevitable. At that point, the only way to enable debt-serfs to service their debts is to give them free money, i.e. Universal Basic Income (UBI). Don't kid yourself that the proponents of UBI are wunnerful folks just trying to be generous; the only purpose of UBI is to enable debt-serfs to keep servicing their debts and stave off the day of reckoning when the debt bubble bursts and everyone wakes up to the reality that prosperity stopped expanding long ago. Thank you, Betty W. ($50), for your stupendously generous contribution to this site -- I am greatly honored by your steadfast support and readership. Thank you, Steve H. ($5/month), for your magnificently generous pledge to this site -- I am greatly honored by your steadfast support and readership.